Welding is a key part of our service offering. 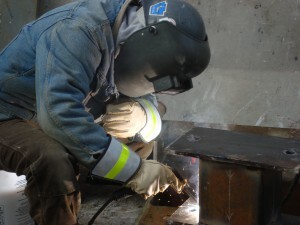 Superior Steel Erectors employs Journeyman Red Seal Welders and CWB certified welders. We believe that a strong apprenticeship program in the field of welding ensures that we are employing welders that have the most up to date training and are keeping pace with today’s fast-changing technology. We employ our own CWB Certified Welding Supervisors who make regular site visits to ensure that our high quality of workmanship is maintained. We have the capacity to weld structural steel, metal deck, aluminum and rebar.